I have no time for Stormont. I have no time for the Good Friday Agreement. I have no time for people who constantly change their position, cement hard gathered weapons into the ground, abduct people and put them down bogs, beat those who do not agree with their rules, have a finger in every financial pie going and seem to have done very nicely for themselves in their day to day lives. They are not Republicans, they are Stalinists. They have turned a once noble Army into an armed militia whose only role is to strong arm any opposition to their insatiable political greed and opportunism. We were both very pleased to receive your note. Hortense, jokingly, says that it must all be a Stalinist plot. While she is not disinterested in politics, she is, in no sense, a political person. However, she is no bitter foe. And in her own profession, the theatre, she must pay a price for her attitudes and the stand that she has taken. Stalinist influence is permeating the American theatre, and Hortense is automatically excluded from even being considered for roles in plays by certain managements because of this fact. Concerning “the mysteries of my style” , you may be amused to know that one Communist Party functionary described it, once in The Daily Worker, as “Trotskyite.” And one of the most current criticisms of my writing in Stalinist sources is that “the rationale of Trotskyism” has given a basis for his “despair,” and through that means he is degenerating. This summer I was in Ireland, and I saw Jim Larkin. All men have weaknesses, but all men are not the victims of their weaknesses. Jim Larkin is a victim of his own weaknesses, and his own temperament. Now, he is embittered and envenomed. He feels that the Irish working class has sold him out. He was not returned in the last elections for the Dáil, and he ran in a working class district. He defended the trials, but thought that Bukharin could not be interested. But Larkin’s formal attitudes do not have much meaning. He is untheoretical and unstable intellectually. He is always a direct actionist, and his direct actionism takes whatever turn that his impulses lead him toward, In the midst, for instance, of a severe fight, he might be walking down the street and see a sparrow trapped in some electric wires where it might die. He will become incensed, and will telephone important members of the government and demand that they have men sent down to release the sparrow immediately, and then this will loom more important than the fight in which he is engaged. He is very garrulous, human and humane, witty, vindictive, vituperative, and he is Irish. At times, he is almost like an embittered version of the stage Irishman. In Ireland, there has never been much theory, and in consequence, never been many men with a rounded view of the reasons why Ireland was struggling. Before the war, the Irish labor movement was very militant and well toward the forefront of the European labor movement. It was defeated in the great Dublin transport strike of 1913, and out of this crushing defeat, the Irish Citizen Army was formed. Larkin left for America, and Larkin says that one of the last things that he said to Connolly was not to go into the National movement, not to join the Irish Volunteers, which was the armed force of the nationalist movement. Connolly did go into the Easter Rebellion, and there is the disputed question as to whether or not he made a mistake. Sean O’Casey, the Irish playwright, in a pamphlet he wrote on the Irish Citizen Army, declares baldly that James Connolly died not for Irish socialism but for Irish nationalism. Others maintain that Connolly could not have remained out of the rising. At all events, the Irish Citizen Army was decimated, and crushed by the Easter Rebellion. There were no leaders left to carry on the social side of Connolly’s doctrines. The entire movement was swept along in a frenzied rise of Irish patriotism and Irish nationalism. Sinn Féin was in complete control of the movement. The leaders of Sinn Féin had only the most vague notions of what they wanted – an Irish Ireland speaking Gaelic, developing its own Irish culture, free of the British crown, and some were not even fighting them for freedom from the crown. In 1921, when the treaty was negotiated in England, there was this same unclarity. Following the treaty, there was the split in the Irish ranks. The record of that split is most saddening to read. It was not a split on real issues. There were two or three documents with different wordings, and they all meant much the same thing. Instead of discussing social programs, they discussed Ireland, and they insulted one another. Out of this split the bitter civil war developed, and the comrades in arms of yesterday assassinated one another. The treatment which the Free State government meted out to its former comrades matches almost that which Stalin has meted out. The bravest fighters of the Irish Republican Army were taken out and placed up against a wall and butchered without any formality. And now, after all the trouble, the Irish people have changed masters, and a new Irish bourgeoisie is developing and coagulating, and the politicians of Sinn Féin are aligned with them and the Church, with reaction rampant, poverty to match even that of Mexico, progressive ideas almost completely shut out, a wall of silence keeping out the best Irish tradition – that of Fintan Lalor, Davitt, and Connolly, and poor Ireland is in a hell of a state. Larkin returned in the early twenties. After defeat, the Irish labor movement needed someone to lead it who could remould a defeated class. Larkin was a great and courageous agitator, but not a leader of a defeated army, and he could not work with any one. Gradually, he lost influence, and now he is old and embittered. Of course, Catholicism plays a strong role in Ireland, and Larkin is a Catholic and talks of the virtues of the Christian home. And suddenly out of his garrulous talk, a flash of his old fire comes through. Perhaps you are riding through the Dublin slums with him, and suddenly, seeing the poor in their filth, standing in front of the filthy buildings in which they are forced to live like animals, and a strong denunciation comes, and there is something of the Jim Larkin who defied the British Army, and at whose words the poor of Dublin came out into the streets in thousands, and flung themselves against the might of Britain and that of the Irish bourgeoisie. Human beings are social products, and Larkin is a product of the Irish movement. The principal instrument of the Irish revolutionaries was always terrorism and direct action, and when Larkin was unable to function with these methods on the wave of a rising and militant movement, he was lost, and the labor bureaucrats outmaneuvered and outsmarted him. When he returned to Ireland from an American jail, he got his following together, and marched on the quarters of the union he had formerly led. He took the building, but later lost it in the law courts, and he is no longer the leader of the transport workers. He has union following, and among his strongest support is that of the butchers and hospital workers. He showed me something in Ireland that few people in Dublin know about. In the Parnell days, a terrorist organization, composed almost exclusively of Dublin workingmen was formed and named the Invincibles. The Invincibles committed the famous Phoenix Park murders in front of the vice-regal lodge, and were denounced by the Church, by Parnell, and by almost the entire Irish nation. There are no monuments in Ireland to the Invincibles. They died in isolation, some of them defiant to the end in their utter isolation. At the spot across from the vice-regal lodge in Phoenix Park, where the murders were committed, there is a patch of earth alongside of the park walk. No matter how often grass is planted over this spot the grass is torn up by the roots, and this spot of earth is left, and always, there is a cross marked into the dirt in commemoration of the Invincibles. Every week, someone – principally, I believe, one of Larkin’s boys – goes there and marks that cross. This has been going on for a long time. In Larkin, there is something of that characteristic of defiant defeat that runs through so much of Irish history, and with it, never any real investigation of causes. But even up to today, he remains the only figure of commanding proportions in the Irish labor movement. The rest is pretty nearly all bureaucracy, tied to the tail of nationalism, enfolded in the cassock robes of the priestcraft, seeing the problems of Irish labor as an Irish question. Ireland is having something of an industrial boom. Certain sections of the Irish working class, the most advanced trade unions – which have been in existence some time – these are better paid than corresponding trade unions in England. But the country is partitioned between an industrial north and an agricultural south. In the south, de Valera is engaged in a program of industrialization. The Irish market is small, and that means that monopolies must be parcelled out to various groups or persons. When these monopolies get going, there will be resultant crises, because they will be able to supply the Irish market with a few months work and production. Also, the new factories are being spread over the country – a program of decentralization – and in many instances, factories are being set up in agricultural areas where there is no trade union strength. It is necessary to further industrialization in Ireland to have, as a consequence, sweat shop conditions. There is a small labor aristocracy and even this lives badly. And below it, poverty that reduces thousands upon thousands to live like animals in the most dire, miserable, and inhuman poverty. I saw some of this poverty. One family of eleven living in one room. The family has lived in this same room for twenty-four years. The building is crumbling, walls falling, ceiling caving in, roof decaying. The oldest in the family is nineteen, the youngest is an undernourished infant of eight months. Six sleep in one bed, three in another, two on the floor. The infant was born last Christmas eve in the bed where six sleep. The role of the Church is important. The Church tells the Irish that they are going to live for ever and be happier in heaven, and this engenders patience. There is a mystic fascination with death in Ireland. In all the homes of the poor, the walls are lined with holy pictures, those of the Sacred Heart predominating. The poor live in utter patience. They have lived in this patience ever since the heyday of Jim Larkin. In those days, at his word, they thronged the streets and threatened the power of England, and of the Irish and Anglo-Irish bourgeoisie. But no more. However, with the industrialization program, there is likely to be some enlargement of the Irish working class, and the economic factors of proletarianization, plus the resulting effects of factory work and familiarity with machines is likely to cause some changes in the consciousness of Irishmen. Familiarity with machines is likely to rub off some of the superstition, and the economic conditions will pose their problems to the Irish workers. There is possibly going to be a change in Ireland because of these factors, and some of the eternal sleep and mud-crusted ignorance is likely to go. But being an agricultural country, a poor country, a country ridden by superstition, it now sleeps, and there is a lot of talk about Ireland, and little is done about Ireland, and a characteristic attitude is sure and what is the bother. 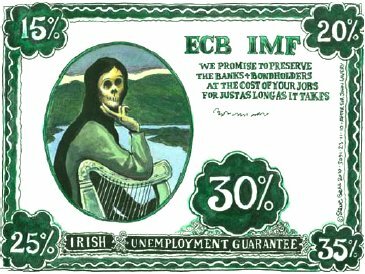 Ireland is no longer merely a victim of England, but of world economy now. Irish nationalism correspondingly has altered from being a progressive movement to a reactionary movement. Fascism could easily triumph in Ireland were fascism vitally necessary to the new rulers of Holy Ireland. The Irish Republican Army is split into factions, some demanding emphasis on a social program, others on a national program. Stalinists are in the former group, but Stalinism is very weak in Ireland, practically inconsequential. It amounts to a few pensionaries. Ireland does not need Stalinism. It has Rome. Rome handles these problems with the necessary efficiency. Rome confuses the struggles, poses the false questions, sidetracks protests as Stalinism now does in advanced countries. As a kind of compensation, Ireland a defeated nation has developed a fine modern literature, just as Germany, defeated and still un-unified at an earlier period, developed German philosophy. But the moral terrorism in the name of the Church and the Nation, and the parochial character of the life and of intellect in Ireland might choke the literature now. So backward is Ireland that even the American motion pictures have a progressive influence in the sense that they make the youth restless, that they produce freer and less strained relationships between the sexes, and that they give a sense of a social life of more advanced countries that is not permitted because of the state of economy in Ireland. Ireland impresses me as being somewhat parallel to Mexico, except that in Mexico there are progressive strains in the country, and in Ireland these are weak and morally terrorized. In part, this is undoubtedly because of Ireland’s lack of mineral resources and wealth, the backwardness and sleep of its labor movement, and the role of the Church. In Ireland, the Church was not the feudal landholder. Behind the scenes, the Church always fought against the Irish people, and spoke for law and order. But at one time, the Church itself was oppressed. The Church and the people became entangled in the consciousness of the Irish, and the religion question befogged the social and economic one. In Mexico, Spain, France, and Russia, the Church was more openly a part of a feudal or pseudo-feudal system. The peasants became anti-clerical because they wanted land. This did not happen in Ireland. In consequence, anti-clericalism did not take the same form. Anti-clericalism amounts to jokes at the priesthood, dislike of the archbishops, and so forth. In earlier days, it was stronger, particularly among the Fenians. But it never took the real form it took in France, Spain, etc. And so the Church has great power in Ireland today. In the most real, vivid, and immediate sense it gives opium to the people. Poor Ireland! She is one of the costs demanded by history in the growth of what we familiarly call our civilization. There is an old poem with the lines – They went forth to battle And they always fell. And today, after having fallen so many times, Ireland is a poor island on the outpost of European civilization, with all its heroic struggles leaving it, after partial victory, poverty-stricken, backward, wallowing in superstition and ignorance. My favorite Irish anecdote is the following. The last castle in Ireland to fall to Cromwell’s army was Castleross on the lakes of Killarney. At that time, the castle was held by the O’Donoghue. For several months, the British could not take the castle. The Irish infantry was more lightly clad than the British, and would always lead the better armored and more heavily clad British down into the bogs where their armed superiority became a handicap, and then the Irish would cut them to pieces. There was an old Gaelic prophecy that Castleross would never fall to a foreign foe until it was attacked by water. There was a proviso in this prophecy. For the lakes of Killarney empty into Dingle Bay, where the water is so shallow that foreign men of war from the sea cannot enter it. The British general heard of this prophecy. He went to Dingle Bay and built flat-bottomed boats and floated them up the lakes of Killarney. He fired one cannon shot at Castleross. And the O’Donoghue, thinking that the prophecy had been fulfilled, surrendered without firing a shot in return. I took the liberty of writing in such detail about Ireland because I thought you might be interested in modern Ireland. They call it the “new Ireland” these days. Hortense joins me in sending our warmest greetings to you and Natalia.